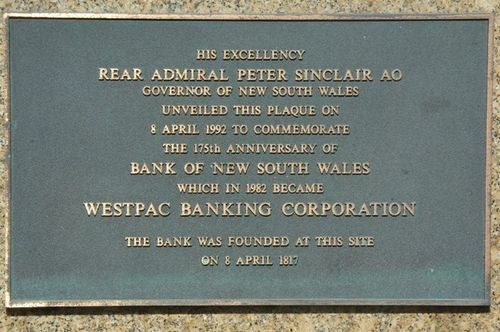 A plaque commemorates the 175th anniversary of the Bank of New South Wales which is now known as Westpac. The bank was founded at this site in 1817. The bank survived competition from the 1820s and the impact of the depression of the 1840s, an event that devastated the colonial economy. Then, after gold was discovered in New South Wales and Victoria in 1851, the bank began a major expansion, setting up agencies and gold-buying agents on every new diggings and in the emerging country towns. From a single office in Sydney in 1850, it grew to a network of 37 branches in Australia and New Zealand by 1861. The bank merged with the Victorian-based Commercial Bank of Australia Ltd in 1982, it also took the opportunity to change its name Westpac Banking Corporation. Westpac was a shortened form of Western Pacific, a name that the board thought more truly reflected its prominent place in this region. Since the Bank had been incorporated in 1850 under its own 'Bank of New South Wales Act' (separate from companies legislation), the new name required an amendment to the old Act.